USA Love List is a resource for consumers to find American-made products. On their site, you can find made-in-the-USA products in virtually any category. We have been partnering with them for many years, and during this time they have referred many customers to us. As a way of saying thanks, we created a Black Friday Deal for their customers, and USA Love List just posted it to their site. But then we thought, “why not let everyone in on the deal too?” So now you can get the same Black Friday discount of 20% off your entire order of organic kids pajamas and free shipping when you use coupon code USALOVE. But you better act soon, this deal expires on January 31, 2019. 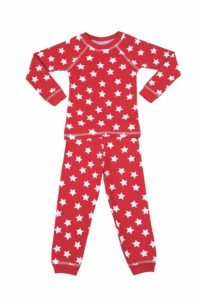 Organic red star pajamas. Perfect for the holidays.